BEIJING: China recorded its widest rural-urban income gap last year since the country launched its reform and opening-up policy in 1978. Think tank researchers warned the gap will continue to widen in the coming years if effective measures to narrow the difference are not implemented soon. The urban per capita net income stood at 17,175 yuan ($2,525) last year, in contrast to 5,153 yuan in the countryside, with the urban-to-rural income ratio being 3.33:1, according to the latest figures from the National Bureau of Statistics. The Ministry of Agriculture had earlier said that the ratio in 2007 was 3.32:1, which narrowed by to 3.31:1 in 2008. 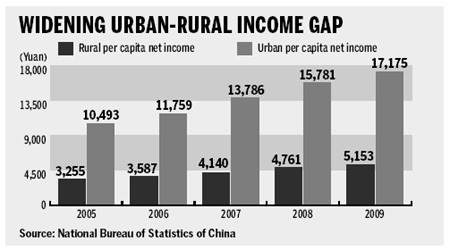 Although there has yet to be an official announcement, China Daily's calculations reveal 2009 saw China's widest urban-rural income gap in the past 32 years. "I am afraid the (urban-rural) income gap will continue to expand as the country focuses its efforts on urban sprawl, rather than rural development," Song Hongyuan, director of the Research Center for the Rural Economy in the Ministry of Agriculture, told China Daily. Several think tank organizations have raised similar warnings ahead of the upcoming annual sessions of top legislators and political advisors, which open Wednesday and Friday respectively, expecting the income disparity issue to top the discussion agenda. Song Xiaowu, president of the China Society of Economic Reform, said the widening urban-rural income gap has partly resulted in China's increasingly "appalling income disparity between the haves and have-nots". Song's organization has already organized a high-level forum and the input and proposals from experts will be submitted to the leadership for review. According to Song, the wealth gap is due to low salaries for employees and migrants in many companies, as well as rapidly growing profits for the management of State-owned enterprises, real estate developers and some private companies. Zhang Dongsheng, director of the Income Distribution Department of the National Development and Reform Commission, admitted that the government "has said more than it has done" to bridge the income gap. "We (the government) didn't think comprehensively on how to address the income disparity issue," said Zhang. "However, social equality and equal human development are the essence of our society, which is becoming richer than ever before." Chi Fulin, president of the Hainan-based China Institute for Reform and Development, urged the government to unveil an overall program to double people's income within five years. He said that in the post-crisis era, China must primarily resort to domestic consumption, instead of investment and foreign trade to keep its economy on the fast track. "To boost domestic consumption, I am urgently expecting the government to announce a program to double people's per capita income in five years," said Chi, who is a member of the National Committee of Chinese People's Political Consultative Conference (CPPCC). He will submit the proposal to the annual session this week. As China is set to draft its 12th Five-Year Plan (2011-15) this year, the country "should take the opportunity and list the double-income target as a national goal", Chi said. When he made the highest bids for food stalls at two local temple fairs, Kebab King Gu Shengli was confident he would make millions. They're rich. They're famous. They never finished high school.